These steps show you how to use Azure command-line interface (CLI) commands to migrate infrastructure as a service (IaaS) resources from the classic deployment model to the Azure Resource Manager deployment model. The article requires the Azure classic CLI. Since Azure CLI is only applicable for Azure Resource Manager resources, it cannot be used for this migration. All the operations described here are idempotent. If you have a problem other than an unsupported feature or a configuration error, we recommend that you retry the prepare, abort, or commit operation. The platform will then try the action again. Read through the list of unsupported configurations or features. If you have virtual machines that use unsupported configurations or features, we recommend that you wait for the feature/configuration support to be announced. Alternatively, you can remove that feature or move out of that configuration to enable migration if it suits your needs. For migration scenarios, you need to set up your environment for both classic and Resource Manager. Install Azure CLI and select your subscription. Select the Azure subscription by using the following command. Register with the migration resource provider by using the following command. Note that in some cases, this command times out. However, the registration will be successful. Please wait five minutes for the registration to finish. You can check the status of the approval by using the following command. Make sure that RegistrationState is Registered before you proceed. Now switch CLI to the asm mode. For this step you'll need to switch to arm mode. Do this with the following command. azure vm list-usage -l "<Your VNET or Deployment's Azure region"
Once you're done verifying this step, you can switch back to asm mode. Get the list of cloud services by using the following command, and then pick the cloud service that you want to migrate. Note that if the VMs in the cloud service are in a virtual network or if they have web/worker roles, you will get an error message. Run the following command to get the deployment name for the cloud service from the verbose output. In most cases, the deployment name is the same as the cloud service name. azure service deployment validate-migration <serviceName> <deploymentName> new "" "" ""
If you want to migrate the VMs to a platform-created virtual network, use the following command. 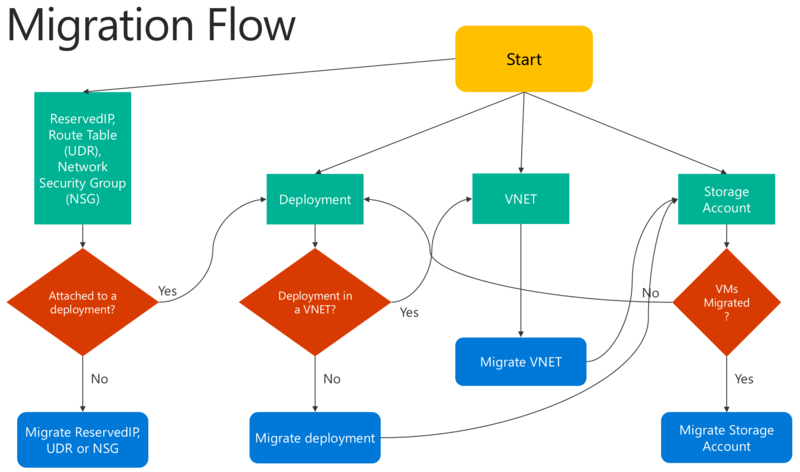 azure service deployment prepare-migration <serviceName> <deploymentName> new "" "" ""
If you want to migrate to an existing virtual network in the Resource Manager deployment model, use the following command. After the prepare operation is successful, you can look through the verbose output to get the migration state of the VMs and ensure that they are in the Prepared state. Check the configuration for the prepared resources by using either CLI or the Azure portal. If you are not ready for migration and you want to go back to the old state, use the following command. If the prepared configuration looks good, you can move forward and commit the resources by using the following command. Pick the virtual network that you want to migrate. Note that if the virtual network contains web/worker roles or VMs with unsupported configurations, you will get a validation error message. Get all the virtual networks in the subscription by using the following command. In the above example, the virtualNetworkName is the entire name "Group classicubuntu16 classicubuntu16". Prepare the virtual network of your choice for migration by using the following command. Check the configuration for the prepared virtual machines by using either CLI or the Azure portal. If you are not ready for migration and you want to go back to the old state, use the following command. Once you're done migrating the virtual machines, we recommend you migrate the storage account. Check the configuration for the prepared storage account by using either CLI or the Azure portal. If you are not ready for migration and you want to go back to the old state, use the following command.